Do You Remember Your First Time... Using a Computer? 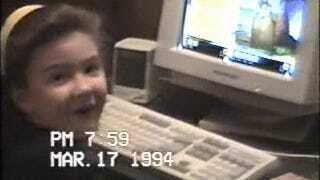 I was given my first computer in 1994, when I was 5-years-old. It was an original Macintosh Classic—the first Apple Macintosh to sell for under $1,000—which my parents bought shortly after its release in 1990 and retired to my bedroom four years later, when they come home one day with a new computer, their second, an updated Apple model, purchased from wherever people bought Macs in 1994. My Mac Classic sat beside my bed, had a 9-inch monochrome CRT display with 512 x 342 pixel resolution, a built-in SuperDrive 3.5 in floppy disk drive, 1 MB RAM, and a 3.6 V lithium battery. It weighed 16 lbs. On it I played a variety of games, the most memorable of which was 5 A Day Adventures, an educational computer game that teaches young children the importance of eating 5 to 9 fruits or vegetables a day. It was designed by the Dole Food Company (in collaboration with the Society for Nutrition Education and Behavior) and had come bundled with our new 1994 Mac. The game featured singing and rapping animated fruits and vegetables, meant to teach children at a 3rd grade level how they are grown, their nutritional value and best cooking methods. I thought it was just about the coolest thing I'd ever seen, in all my 5 years of life. My parents told me that the person who sold them their new computer said we'd one day be able to watch TV on our computers; this, to me, seemed an impossible magic. I tell you this, because a friend of mine recently posted to Facebook a still image (pictured above) from a home movie taken the day she used her first computer for the first time, too. I remember before I got that computer I used to beg my mom to take me to Best Buy, where I would play on the sample computers for hours. She would literally have to drag me out of the store. This was the day she finally caved. This was the start of my nerd tendencies—well not the start, obviously, if the first thing I did was go straight to Encyclopedia Britannica to research elephant seals. Everyone remembers their first time. What was yours?